Sept. 9, 2011 “Text, poke, like, or chat…” What about TALK? I love how this Trevor “Talk To Me” 3-word anti-bullying campaign by The Trevor Project goes back into time to cut through the social media layers to get real with face time. The Talk to Me campaign for conversation succinctly sums the “Alone Together” dynamic that MIT sociologist Sherry Turkle mentions in her new book (NYT review) suggesting face to face outreach is not only necessary but preferable when it comes to sincere, genuine, empathetic connection as human beings. I’m seeing this a lot with teens right now too, when they want to be raw and real and feel completely safe with PRIVACY it’s become “no don’t (FB/Skype/text) me, I’ll meet you at…” or “call me on the landline” in an ironic convergence of digital deluge meets old school non-forwardable/traceable face time. We CANNOT wrongly assume and rely on social media’s ‘always on’ connectivity as prevention or intervention for teens to feel ‘supported’ in times of stress. Sure, it can help, but as the CDC mentions in this article, whether it’s teen dating violence, bullying stress or sexuality issues, BEING THERE (fully present in the present, preferably in person) for someone to talk to is paramount. Suicide is the third leading cause of death among 15 to 24 year-olds and LGB youth are four times more likely to attempt suicide than their straight peers. In our anti-bullying series focusing on solutions-based learning, it wouldn’t be complete without a nod to the recent “bullycide” media coverage, since this week, September 4th – 10th is National Suicide Prevention Week. So today’s guest post is a deeper dive for tomorrow’s World Suicide Prevention Day, written by Jeanne, founder of “Chronic Healing.com” who actually took the proper training with regard to verbiage, suicide alertness/warning signs and journalistic responsibility in word choice to enlighten the rest of us. It’s not just a ‘cya’ move, since I’m befuddled when kids DO “talk to me” about certain privileged information, because quite frankly I don’t know what to DO with it when it’s NOT life threatening. I’ve decided the whole ‘broach vs breach’ subject is a separate blog post to tackle and research in terms of where the ‘lines’ of liability are…Especially if something were to happen involving self-harm. But for now? I’m fully focused on PREVENTION. Talk to Me is a simple outreached hand…a human touch…that goes a looooooong way in ‘getting there.’ So yep, I’m taking the pledge today. You can “talk to me to start the conversation,”…even if I have to refer you elsewhere to finish it. Can New Media Curb Anxiety in Stressed Out Students? Project Happiness, How Are YOU Faring? Guest Post by Jeanne Endo of Chronic Healing.com who took a suicide alertness class to learn about how to connect people who need them to suicide first aid resources. Also, for quick acronym awareness: SafeTALK (SAFE acronym=Suicide Alertness for Everyone) The class is available as training for anyone 15 years and up…might just take it myself! 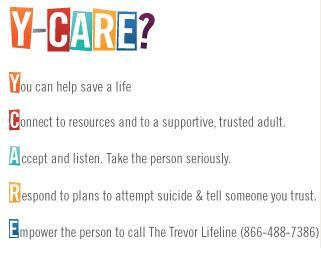 PLEASE NOTE: If you are having thoughts of suicide, I urge you to call the hotline in your geographic area to speak with personnel trained in suicide first aid intervention. by Jeanne at Chronic Healing.com. Recently, I heard there was going to be a class called safeTALK (sponsored by National Alliance on Mental Illness (NAMI) and the Mental Health Association). The acronym safeTALK stands for ‘Suicide Alertness For Everyone’/’Tell, Ask, Listen, KeepSafe’. Having had direct contact with multiple people who were experiencing thoughts of suicide in the days before I learned of the class, I was pleased and grateful to have the opportunity to take such a well-regarded class about such an important topic. The class brochure came to my attention at a time when I was wishing I had more knowledge about this topic and how to facilitate getting people to the suicide first aid resources they needed. A person with thoughts of suicide usually gives what are referred to as “invitations”, commonly known as signs or indicators. This is where the person is literally inviting help and tells someone (as clearly as possible either by his/her words, behaviors, or actions) that he/she is having thoughts of suicide. Invitations may not always be blatantly obvious and they are sometimes missed. An alert helper knows what to look for and is thus more likely to notice such “invitations”. Now, I know many readers here may be thinking that much of what’s listed above could be a sign of other issues and not be “invitations” at all. For example, the “physical” section above may look familiar to chronic illness patients who are not having thoughts of suicide. I understand where you’re coming from if you’re thinking this. The important thing that I took out of learning the invitations above (and others) is that it really can be difficult to tell an “invitation” from, say, a chronic illness patient who is struggling with issues such as having the time/energy to focus on appearance as they might have previously. However, since these are a few of the key “invitations” that people with thoughts of suicide tend to display or say, I think it is well worth noting them. 1) Are you thinking about suicide? 2) Are you thinking of killing yourself? While these may seem very blunt ways of asking, this is not a time to beat around the bush. It is important to be direct with your questions (like above). If you are concerned enough about the person to ask the question in the first place, it is important to be direct. Again, bringing up the topic won’t “plant the seed in anyone’s head”. So, asking directly like this is an important means for determining whether the person is, in fact at risk for completing suicide. (Please note that I used the word “complete” rather than “commit”. Please refer to the American Foundation for Suicide Prevention’s “Recommendations for language” section. The safeTALK class taught us to use the word “complete” rather than “commit”). The purpose of becoming a trained helper (by taking a class like safeTALK) is not to learn counseling techniques or to do a suicide intervention – as these techniques require much more training. The purpose of the class is to simply recognize a person’s invitations, ask them directly about suicide, and if their answer is yes, to connect that person with suicide thoughts to suicide first aid intervention caregivers. An example of a KeepSafe statement would be, “We need extra help. I want to connect you with someone who can help you KeepSafe”. At this point I would like to pause to make it very clear that I am not trained in suicide first aid intervention such as the ASIST (Applied Suicide Intervention Skills Training) program. The safeTALK class I took essentially helps to bridge the gap between the community and suicide first aid resources (i.e. suicide prevention hotlines). Alternatively, you might want to check with one of the organizations that sponsored the workshop I attended. Perhaps they can direct you to one in your area. I cannot recommend this class highly enough. Our instructor, Eric Weaver (Executive Director of Overcoming the Darkness) was informative, helpful, and encouraging. With the content of the material being so serious, he obviously took measures to ensure that careful language choices were made and that there was an appropriate tone for the classroom atmosphere. At the same time, I do not want to leave the impression that the class was a gloomy experience. On the contrary, everyone in the room was clearly highly motivated to get everything they could out of the class and it was a positive, empowering experience because the end goal of taking such a class is to help people gain access to the suicide first aid resources they need. Having never taken a class quite like this, I didn’t know exactly what to expect. Early on, I became very comfortable thanks to the helpful instructor, great materials (videos) presented during the class, and the wonderful people who took the class with me. — > Tel: In the UK dial… 08457 90 90 90 (UK local rate) or +44 1603 611311 AND in the Republic of Ireland dial 1850 60 90 90. Thank you for writing about the extremely important topic of suicide prevention and for including my post as well. It’s so important to speak out about suicide. The numbers are staggering. Let’s see what we can do to reduce the stigma… and to help more people who need them to find suicide first aid resources!